I had to dig way back in my Gmail archives to figure out how it was that I first interacted with Choren. I had written several articles on biomass gasification in 2006, and when I announced that I would be moving to Scotland in early 2007, I received an e-mail from Dr. David Henson at Choren. 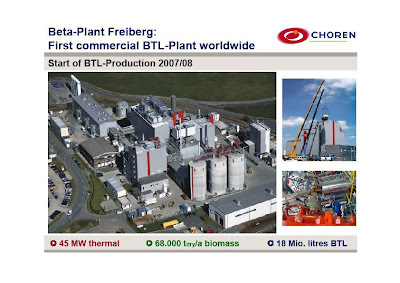 David, at that time in Business Development at Choren and now the President of Choren USA, said he had been reading the blog, and he extended an invitation to visit the biomass-to-liquids (BTL) plant that Choren was building in Freiberg, Germany. While I tentatively planned to visit several times while I was living in Scotland, it wasn’t until I recently moved to the Netherlands that I was actually able to make the visit. So here is some background information on BTL, followed by the trip report from my visit on April 18th, 2008 (the day after German Chancellor Angela Merkel and Rob Routs from Shell visited for the inauguration of the facility). I have written a number of articles on biomass gasification. However, let’s review. Biomass gasification takes biomass – ideally some sort of waste (and I understand that the term “waste” can be contentious) plant material – and partially burns the material with a controlled amount of oxygen to produce carbon monoxide and hydrogen (synthesis gas, or syngas). One of the often overlooked benefits of the thermochemical approach over fermentation is that it can be used to produce chemicals, synthetic natural gas, or electricity – and from a wide range of feedstocks. 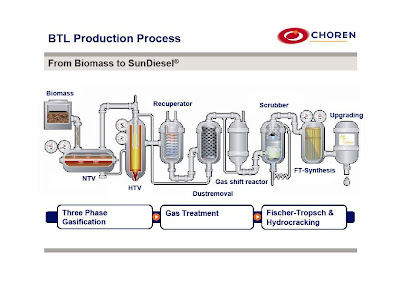 There are many different variations of how the gasification process is done, and I will delve into the specifics of what Choren is doing in the next section. Once you have produced syngas, you can go a number of different directions. You can burn the syngas to produce combined heat and power (this has some cleanliness and efficiency advantages over directly burning the biomass), produce methanol, ethanol (Range Fuels, Coskata, Syntec), mixed alcohols (Standard Alcohol, Power Ecalene Fuels), or hydrocarbons like diesel via the Fischer-Tropsch process (FT). This latter approach is what Choren is doing. The diesel they are producing is not biodiesel, but “green diesel” as I have described in this essay (scroll down to the “renewable diesel” section). To my knowledge no other company in the world is as far along as Choren is in producing diesel (and maybe any liquid fuel) from gasifying biomass. Whereas Range Fuels is currently building a plant (and the schedule for that is already slipping), and Coskata is building a much smaller demonstration plant, Choren has been piloting their technology since 1998, and their new plant is mechanically complete. (Yet Choren – funded largely by private investors – has been pretty low-key, issuing a fraction of the press releases of some of the other biofuel companies). 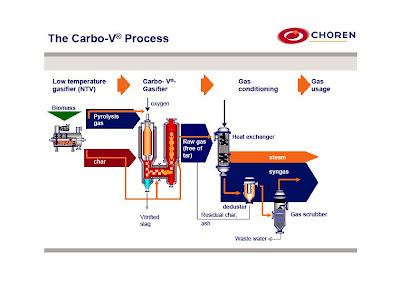 The Choren process (incidentally, Choren’s name comes from Carbon, hydrogen, oxygen, and renewable) starts off by feeding biomass into a low-temperature gasifier (about 500 degrees C). The purpose of this step is to remove volatile components that will form tars at higher temperatures. What remains in the gasifier is called char, and is fed into the high temperature gasifier. The volatile components are mixed with oxygen and steam and also fed into the high temperature gasifier where temperatures are around 1400 degrees C. Under these conditions, the volatile components are broken down into syngas. The char is first pulverized, and then blown into the bottom of the high-temperature gasifier. The gas that exits the high-temperature gasifier is cooled, generating steam in the process that is used for power generation. The gas is then further treated (filtered and scrubbed), and it is ready for the Fischer-Tropsch process. You can see an animation of the entire process here. The gasification section of the plant has been in operation since 2004, proving the scale up of the design. Since 2005, the FT section of the plant has been under construction and is now mechanically complete. I won’t go into detail on the FT process. That technology has been around for almost 100 years, and is best-known as the process by which Germany produced their fuel from coal in World War II. Shell – a world leader in FT technology – provided the FT for the Choren plant. If you are interested in learning more about Shell FT, you can read here about the 15 years of experience they have gained from their gas-to-liquids (GTL) plant in Bintulu, Malaysia. (In addition to providing the FT technology, Shell is also an investor in Choren). It was difficult to find the place, and I got to brush up on my German a couple of times when I had to ask for directions. But finally we (I was with a colleague) found the place and met up with David. He started off with an introductory slide show in which he walked us through the process. One of the more interesting comments he made was that the potential production of their second generation product (dubbed SunDiesel®) is up to 3 times the production of first generation fuels. A third party analysis of various biofuels may be found here, at the Fachagentur fur Nachwachsenden Rohstoffe (FNR). This agency is essentially the German Renewable Energy Department. Detailed information on various BTL platforms can be found here. The new Choren plant, utilizes forest residue and waste wood and will take in 68,000 tons of biomass per year and produce 18 million liters of diesel and 45 MW of power. One thing David mentioned that too many in this business don’t seem to get is “You know, biomass just isn’t very energy dense.” Therein lies the source of a lot of people’s misconceptions about rapidly scaling up biomass to replace petroleum. The energy density is problematic to say that least – and this poses big logistical challenges. Biomass requirement: About 65,000 tonnes of wood (dry matter) p.a. Of particular interest was the material handling piece, as this is a major cost factor in driving up the capital costs in a BTL plant. We traced out how the material comes into the plant, and how the flows of volatiles and char come off of the low-temperature gasifier. The one piece we didn’t really look at was the FT back end, but then again I have seen those before. Over 150 suppliers and around 50 assembly companies, including many from the region, were involved in the building of the Beta plant. CHOREN designed and manufactured 180 main components itself. Over 600 companies had been involved in the development of the Carbo-V® technology. By April 2008 around 800,000 man-hours have been utilized in development and assembly, and the overall number of employees almost doubled. In the coming months 113 sub-systems in 26 main operating units will be started up individually then in sequence. Around 1,200 steps will be needed for the commissioning of these systems, which in themselves consist of several sub-steps. A highly-complex process, which, not unusually for plants of this complexity, will take 8 to 12 months. CHOREN will receive valuable support for this from Shell. Capital costs for BTL are still pretty high. On the other hand, Choren’s costs were sunk at a much lower capital cost. Oil at $120/bbl should help them out quite a bit – provided they have a pretty good contract on their biomass. I have no doubt that they will be successful from a technical standpoint. They have a lot of experience on the gasification piece, having piloted it since the 90′s. Shell has many years of experience on the back-end FT piece. No doubt there will be some unexpected bumps as they commission the plant; after all it is a first of its kind and speaking from experience issues will come up. But they have a lot of engineers on staff, and I don’t think they will find any show-stoppers. There are those who insist that using biomass for fuels can never be sustainable – so there are likely to be critics on that front. However, I disagree with this. There are a number of biomass sources that are true waste, and biomass can be grown sustainably. On the other hand, it can also be used to strip-mine the soil. Like most things, there are right ways and wrong ways to go about it. Biofuels have a part to play. But it would be foolish to try to completely replace petroleum with biofuels. That would require unsustainable practices. Incidentally, Choren has a life-cycle-analysis (LCA) on their process. Highlights can be seen here. Brochures and lectures for downloading may be found on Choren’s site here.